Aquatic herb to 2 m tall Stem: reddish and covered in a gelatinous substance. 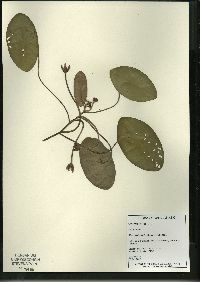 Leaves: alternate, floating, long-stalked (attached to center of leaf), green above, reddish beneath, 4 - 12 cm long, about half as wide, oval to elliptic. Leaf stalks and leaf undersides covered in a gelatinous substance. Flowers: borne singly on a 5 - 20 cm long stalk, barely emergent, dull reddish purple, to 2.5 cm wide, tepals six. Stamens twelve to eighteen, upright. Anthers deep purple. 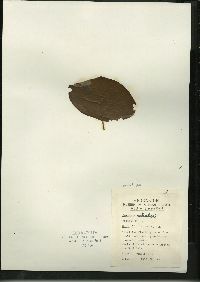 Fruit: a capsule, 3 - 5 mm long, cylindrical, leathery. Seed 2 - 3 mm long, egg-shaped. Rhizomes: long, creeping, and anchored in the muddy bottom. 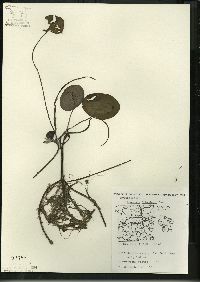 Similar species: Brasenia schreberi is the only representative of the family Cabombaceae in the Chicago Region. 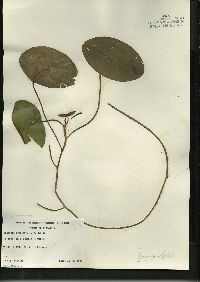 The gelatinous substance covering its leaf stalks and leaf undersides is unique. 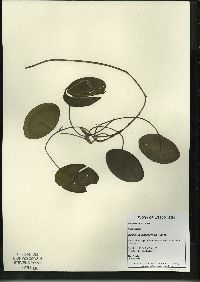 It is distinguished from water lilies by not having a slit or notch in its oval leaves. 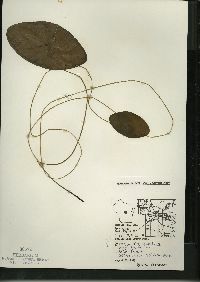 Habitat and ecology: Found in clear, quiet lakes and ponds. Grows in water 0.5 - 3 m deep. Probably extirpated in some of the Chicago Region counties. 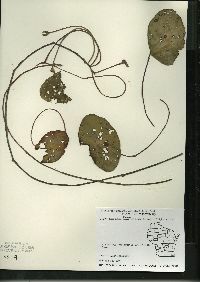 Notes: The fruit capsules ripen underwater and decay to release their seeds. Native Americans once used the rhizomes and leaves for food and medicinal purposes. Etymology: The origin of the word Brasenia is obscure. Schreberi is for Johann Christian Daniel von Schreber, a German botanist and student of Linnaeus in the 18th century. 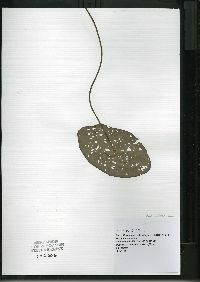 Leaf blade 3.5-13.5 × 2-8 cm. Flowers ca. 2 cm diam. 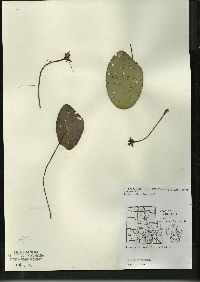 ; perianth parts dull purple, 10-20 × 2-7 mm; petals slightly longer and narrower than sepals. Fruits 6-10 mm. 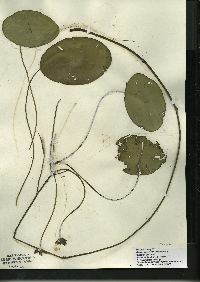 Seeds 1-2, 2.5-4 × 2-3 mm. 2 n = 80. Flowering late spring-summer. Oligotrophic or mesotrophic ponds, lakes, and sluggish streams; 0-2000 m; Alta., B.C., Man., N.B., Nfld., N.S., Ont., Que. ; Ala., Alaska, Ark., Calif., Conn., Del., D.C., Fla., Ga., Idaho, Ill., Ind., Iowa, Kans., Ky., La., Maine, Md., Mass., Mich., Minn., Miss., Mo., Mont., N.H., N.J., N.Y., N.C., Ohio, Okla., Oreg., Pa., R.I., S.C., Tenn., Tex., Vt., Va., Wash., W.Va., Wis.; Mexico; West Indies (Cuba, Jamaica, Hispaniola); Central America (Guatemala and Belize); South America (se Venezuela); e Asia; Africa; e Australia. Frequent, usually in 3-5 feet of water, on the borders of lakes and in a few dredged ditches in the lake area, very local south of this area. Reported in the southern part of the state by Banta from a pond in Jefferson County and by Clapp and Schneck, who say it was rare. 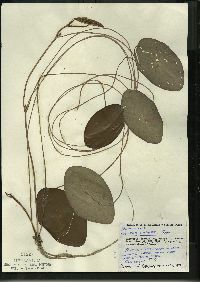 Stem to 2 m; lf-blades elliptic, 4-12 cm, half as wide; fls dull purple, on stout peduncles to 15 cm; sep and pet persistent, the latter 12-16 mm, the former somewhat shorter; 2n=80. Quiet water; N.S. and e. Que. to Minn., s. to Fla. and Tex. ; also on the Pacific slope, and in tropical Amer., and the Old World. Summer.